Exactly two weeks ago, we asked you to vote in our 2018 SONA poll. We wanted to know where you would be tuning in to watch President Duterte’s yearly address to the nation, which, as it turned out, was overshadowed by the leadership scuffle in the House of Representatives. 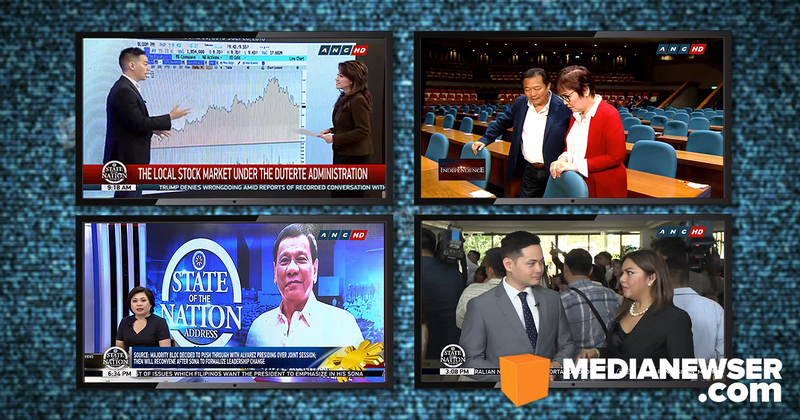 Aside from the usual choices like ABS-CBN, GMA-7, TV5, CNN Philippines and ANC, we also included the newest kid on the news block, One News, as well as lesser-known channels like UNTV, Net25, and the state-owned PTV4. Now, after 12 days and more than 8,000 votes later, you, our readers, have spoken. Topping our MNP Poll this year was ANC, which scored a whopping 41.28%, followed by ABS-CBN Channel 2 with 19.7%. ANC’s coverage, which began in the morning and lasted for more than 17 hours, was, as many of our readers noted, the "most consistent” among the networks. “I tuned in to all [the networks] but ANC was the most consistent. Their morning coverage was the strongest in my opinion. If Cathy Yang decides to stop covering business, she could be a political journalist. I also like Lynda Jumilla and Christian Esguerra,” wrote by a certain Gwen Calimlim in our comment box. Just to recap, the Kapamilya news channel’s wall-to-wall coverage of the State of the Nation Address was anchored by Lynda Jumilla, with other ANC talents like Annalisa Burgos and Cathy Yang anchoring special SONA editions of their morning programs. It also featured the duo of Karmina Constantino and Christian Esguerra, who were deployed at the Batasang Pambansa. Some of the highlights of ANC’s coverage were the two-part Dissecting Data segments of Market Edge with Cathy Yang, which looked into the hits and misses of the Dutertenomics, and the third installment of Tina Monzon-Palma’s Independence series. ABS-CBN, which was anchored by Karen Davila, also scored positive feedback from our readers, with most of them praising how the Bandila anchor handled the Kapamilya Network’s coverage, which had Tony La Viña and Edca Co as guest analysts. “If I have to rank them I would say ABS-CBN with Karen Davila was the best. She clearly did her homework and asked substantive questions to her guests,” wrote by a certain Quitzi. Another one noted, "ABS and ANC were the best for me. Karen Davila and Cathy were particularly outstanding especially in dissecting all the information about the economy." The local CNN station, which we should note was the first among the networks to report about the shakeup at the House of Representatives, meanwhile, ranked third overall with 12.95%, ahead of GMA-7’s 8.44% and One News’ 6%. It, however, received mixed response from our readers, with some praising its morning coverage, and others criticizing how its 9PM broadcast reported on the SONA. One of our readers wrote: “I thought CNN Philippines' morning coverage was outstanding. Pia and Pinky were top-notch, Joyce Ylas was good, until they broadcast the 9pm Newsroom. It was hard listening to Cherie interviewing her guests, Mark Villar and Arthur Tugade." "What I dislike was CNN Philippines which became a propaganda network. How come Cherie was allowed to have her old boss Arthur Tugade as an analyst of sorts? I wouldn't be surprised if it was from PTV but for CNN Philippines it was a horrible choice!" wrote by a certain Jeff Tan. Rounding out our poll were UNTV, which scored 3.85%, TV5 with 3.28%, GMA News TV with 2.35%, PTV4 with 1.88%, and Net25 with 0.27%. Our poll ran from July 16 to 27 and garnered a total of 8,066 votes.